Impingement Syndrome - Definition & Anatomy Video - Jeffrey H. Berg, M.D. You have pain on the side of your shoulder. It tends to hurt more with overhead activities. As far as you can recall, there was no traumatic injury that brought it on. If this sounds like you, then there is a good chance you have impingement syndrome. It is even more likely if you are between the ages of 30 and 50. Impingement syndrome is one of the most common shoulder problems. As such, it is referred to by many different names: Rotator cuff tendinitis, rotator cuff bursitis, subacromial impingement syndrome, rotator cuff impingement syndrome, subacromial bursitis and even several others. 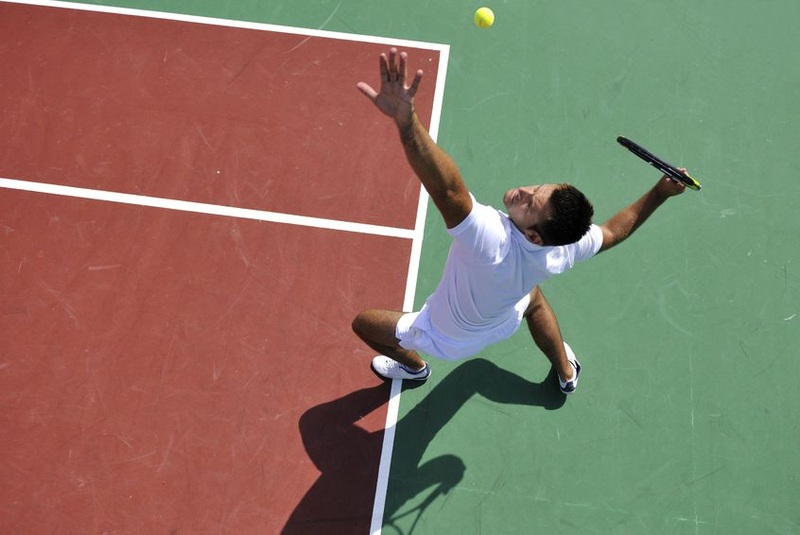 Impingement Syndrome: What is it? Impingement syndrome is a shoulder problem that consists of inflammation and swelling of the subacromial bursa and occasionally the rotator cuff tendons. It is almost always associated with some functional problem of the shoulder. The most common associated dysfunction is a reduction in shoulder range of motion. Mostly this is a reduction in your motion that allows you to place your hand behind your back (internal rotation). These two issues, the inflamed tissue and the shoulder dysfunction, tend to promote one another, maintaining the pain until they are corrected. Impingement syndrome often occurs alone but it can also develop as a result of almost any shoulder problem. This is part of the reason that shoulder issues can often be so challenging to diagnose. Since impingement syndrome exists along with the primary problem, the symptoms of many shoulder problems are simply those of impingement syndrome. As a result, they are often very similar and therefore often difficult to differentiate. As you may recall from an earlier post, the rotator cuff is a group of four tendons that develop from four muscles originating on the shoulder blade. The tendons combine to form the rotator cuff as they progress towards and ultimately insert on the upper part of the humerus. When these rotator cuff muscles contract, they shorten. This then pulls on the rotator cuff tendons, which moves the arm. Lying between the rotator cuff and the bone resting on the top of your shoulder (acromion) is the subacromial space. Within this space, sits the subacromial bursa. When not inflamed, the bursa is a thin filmy tissue. It serves to protect the rotator cuff from getting irritated as we lift our arm. 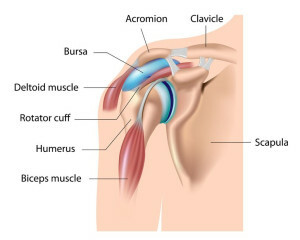 The bursa not only rests on the top of the rotator cuff but also extends down the arm some. Inflammation of this bursal extension is responsible for the commonly noted odd location of pain on the side of the upper arm. 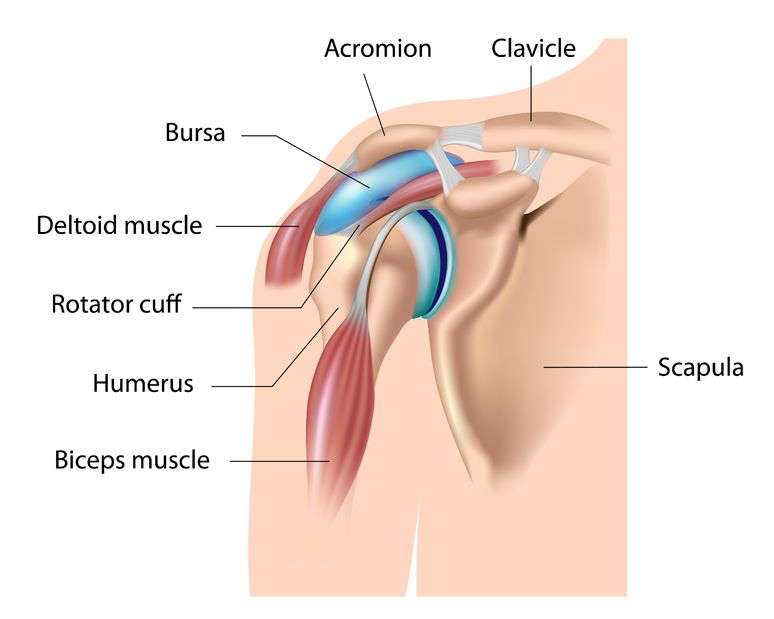 When we lift our arm, the bursa gets squeezed between the rotator cuff and the acromion. Sometimes, the acromion has a spur on its undersurface that narrows this space even more, essentially lowering “the roof” of the space. More often, as a result of a weakened rotator cuff or tightness of tissue in the back of the shoulder, the humerus actually rises more than normal during shoulder motion. This also narrows the subacromial space, in this case by raising “the floor”. Nonetheless, the ultimate result is the same. When the bursa and rotator cuff get squeezed, either acutely and forcibly during a traumatic event or more commonly from repeated overhead activities, the bursa and tendons swell and become inflamed, just like other body parts following an injury. The result is pain that leads to further dysfunction of the shoulder and progression of the problem. View the following video to see the normal subacromial space as well as subacromial bursitis. Fortunately most cases of impingement syndrome either resolve on their own or respond to non-surgical treatment. On occasion, surgery is necessary. We will discuss the treatment of impingement syndrome in a later post.